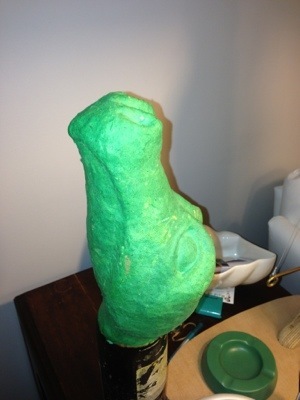 I forgot in the last post to upload a photo of the papier mâché casting I have made of the sculpture of dragon. In the last 2 days I have cut the eyes out and started to make the eyelids to fit inside the eyes but pivot around the eyeball. The eyelids were cast in handmade paper over a ping pong ball wrapped in cling film to stop the paper sticking. If you were wondering, the whole sculpt for dragon has been done on an old wine bottle full of water so that I could move the sculpture around but it would not tip over. 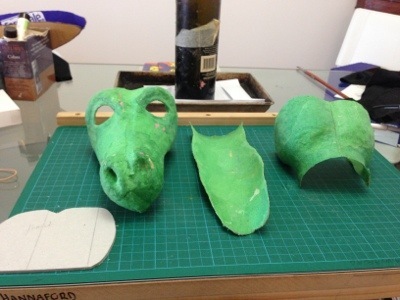 I was reflecting on how long it has been since I last sculpted a puppet using plasticene and I am astonished that it has been 5 years since I sculpted my first dragon puppet Augthar. It was nice to work again in plasticene and hand made paper- a really nice change from all the work I do in building puppets from foam and fabric. You can see by the images that I roughed out the shape of the head first and then got stuck into details like the eyes and nostrils. The white eyes are a ping pong ball cut in half and pushed into the plasticene with the eyelids added later. In order to stop the papier mache from sticking to the ping pong balls the first layer of paper in that area was just moistened with water- no glue. The paper I have used is the paper I made years ago from recycled coloured office paper. I have applied 4 layers of paper in this version of the head and the glue is waterded down PVA glue since the handmade paper is extremely absorbant the glue goes right through the paper giving a strong yet flexible result. I have been building puppets now for 8 years and most of my practice has focused on building hand puppets out of foam in what is called “Muppet Style”. 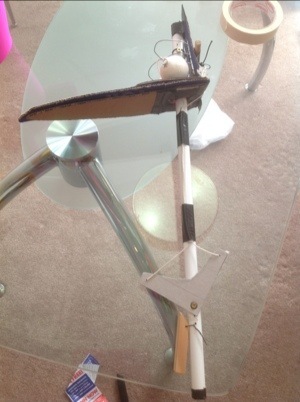 I am now incorporating simple puppet mechanisms such as eyeblinks but I now want to challenge myself to build more sophisticated puppet mechanism similar to what is used in the Zazu puppet in the musical version of the Lion King. So I have started building a new dragon puppet. Ultimately, I want the mouth to open and close via a trigger on the handle of the puppet as well as incorporate an eye blink that not only closes but also opens wide for when the puppet is surprised. 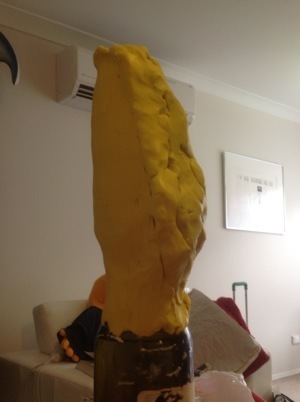 So far I have built a 3D maquette of the mechanism and I have started building the head out of plasticine. My visits to Loutky and talking with Wez, the creative spark of Loutky has really helped me understand how mechanisms work inside the head of a puppet. A very cool place to hang out and explore the world of puppetry. A friend recently invited me to afternoon tea at a new Teahouse in Epping called Loutky. Loutky is Czech for Puppet and the whole concept of the Teahouse is to encourage the visitor to experience the world of puppetry either by watching a puppet show or by choosing a book to read from the extensive library while enjoying a lovely selection of tea or coffee. Since my first visit, I have visited many times and I like to take the puppet I am working on and just sit and enjoy the relaxed atmosphere. I have also watched Wez the owner/ creative genius of Loutky carve the most exquisite puppets for their resident shows or special commissions. Wez has kindly helped me develop the mechanical concepts for my next puppet and he has invited me to collaborate with him to build the puppets for the first show in 2013. This will be the first time that I have had a hand in building puppets for a real show.